Here is a wide-open, endless exploration of musical expression and ability. 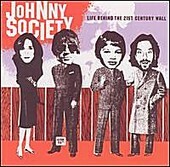 Johnny Society's Life Behind The 21st Century Wall is a course in how to make a record the way you want, incorporate the sounds you're feeling, and still make a great record - one that plays well from start to finish - without compromising the songs or yourself. From glam rock, blues, dub reggae, Americana, funk, and rock to vanilla pop, Johnny Society spins the wheel and takes all the prizes, delivering a sound that is not merely a single, tag-able word, but a collection of his endless record collection and diversity as a musician. I'll give it a B.